It was a busy, busy year! JANUARY found Greg and MK traveling to the US, leaving the rainy season behind. First stop was Seattle where they were welcomed by Mark and Becci Crowe. MK got to experience snow, skiing and the Pacific Ocean. Carrie Culp organised what turned out to be the most amazing and successful fund raiser, thank you Carrie and everyone involved. A great start to the year. 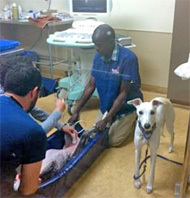 MK flew to San Francisco for veterinary tech. training at Pets Unlimited. This was all arranged by Linda Tabor and Kathy Gervais, they had been impressed with him while camping and looking for Painted dogs in Hwange National Park last year. Linda was especially grateful after MK warned her of a snake he heard in the ground cover near her feet. He was a guest of Amy Tan and her husband during his training. Amy is planning to visit Zimbabwe soon. Greg made a hop down to Portland for a fund raiser at Oregon Zoo and at Mango Safaris. It was great to see Sarah Walker who had an opportunity to see the work in Sizinda last year after a tour to Mana Pools. Also in Portland was the first of hopefully many meetings with Charis Henrie and Anne Warner to discuss curriculum for a conservation orientated primary school in Sizinda, it is intended that from day one at school, conservation will be integrated in all learning and practice. After that was Santa Cruz to meet Guy Oliver and Brent Wright to discuss the new collar design that apart from protecting the dogs against snares will be lighter and provide more valuable data on dispersal and habitat use. Then it was back to San Francisco for a special PDRT fundraiser organised by Linda & Kathy and kindly hosted by Walli Finch in Portola Valley. On to Brookfield Zoo in Chicago where Greg did a presentation at the zoo as well as Misericordia. Special thanks to Dara Kelly who not only manages the PDRT Facebook page but took time out to chauffeur Greg whilst in Chicago. Greg and MK met up again very briefly as each arrived in Houston for a presentation/fund raiser kindly put together and hosted by Cathy and Rob Gabor. The evening was a great success with Anne London providing some amazing artwork to assist with the fundraising. No rest for the weary, MK continued vet training with Lisa-Marie Avendano at the Houston Zoo and then onto a concentrated course on welding, a skill he put to good use back in Sizinda. Elizabeth and Cameron made him part of the family, fixing him breakfast and packing a lunch along with their four kids. Happily Elizabeth and Cameron made it to PDRT later on in the year which was special. FEBRUARY MK flew to his final destination, Washington DC, before heading home. Here he was met by Mary Wasserman who was also Stateside to spend the holidays with family. MK was strictly a tourist enjoying the museums and National aquarium, first time ice skating followed by a professional hockey game, and a quick trip to touch the Atlantic Ocean, knowing the coast of Africa was just beyond the horizon. wonderful visit with Nina Fascione at Defenders of Wildlife, an annual stop. Lunch with resolv.org. A brown bag with AWF and then to WWF HQ where Africa Biodiversity Collaborative Group had set up a webinar for a presentation on Greg's trans-boundary initiative. Back in Sizinda resetting tents, pumping 20,000 liters of rainwater captured in the yet to be completed cistern to the brick water tower, and a full out effort to get the Workshops/Lab ready for installation of the steel truss frame and solar panel roof. MARCH, Mary returned mid-month to coordinate with Greg and MK a long list of projects to get accomplished while Greg went on a European tour, departing the 26th for the opening of the new painted reserve at Yorkshire Wildlife Park, England. April was a whirlwind trip through Europe for Greg where he visited Zoo la Palmyre to see a new anesthesia for Painted dogs that was developed by the late Greg Flemming of Disney Orlando, then onto Munich for a "Wild Monday" with Claudia Praxmayer and Frank Bohnke. this was followed by a great evening with Lorenz Knauer, Monica Lieschke and Ulrike Beckmann from the Jane Goodall Institute. After that was a visit to see wolf conservation in Germany in action. Here Greg kindly chauffeured by Sabine Bengtsson visited LUPUS the German Institute for Wolf Monitoring and Research and was hosted by Ilka Reinhardt one of the founders. 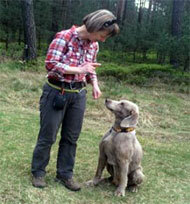 Here he got to see how Ilka’s Weimararner dog assisted with the wolf tracking. Meanwhile, MK and crew were productive with improvements to Conservation Way (the road to our site), a cement shop that provides materials at an affordable price for the community to assist them with their own building projects, a car park was created with gravel from the water collection pit in progress, and a locally hired mason completed our mechanics pit needed for maintaining vehicles. MAY, just in time the workshop/lab columns were ready for the roof and the arrival of Karine Aigner, wildlife photographer (www.karineaigner.com) and Ken Geiger, Deputy Director of Photography (Technology), National Geographic Magazine. Taking a two week 'vacation' master welder Ken had a daunting task to set up the grid, making sure the solar panels would slide into place. With MK to assist and learning to weld, the last truss was set on the final day, a monumental achievement. MK then finished the tweaking the final frames before dropping the panels . His welding skills continue to be a huge asset to PDRT. Ron van der A from Stichting Painted Dog conservation in the Netherlands came with two groups for luncheon, along with a very welcome $2,500 donation. Not quite a visitor but a very welcome addition to our vehicle fleet was a truck imported from Japan that made us realize how we achieved anything without it. Dara Kelly visited from Brookfield Zoo and as Dara cares for the painted dogs it was good to share dog thoughts as well as ways captive and wild organisations can assist each other. PDRT welcomes zoo professionals and when facilities are more complete, plans are to run field based courses and share knowledge. July saw Brandon Davis visit, Brandon is one of the founders of the Painted Dog Protection Initiative which supports the ongoing anti snare collar initiative. In AUGUST Greg attended the regional southern African Dog and Cheetah workshop in South Africa, here Greg identified to the participants the emerging threat of disturbing dens. September saw Sophie Pearson and husband Christoff at PDRT. They were traveling across Africa researching sustainable and people oriented conservation organizations and were steered to Greg by the Jane Goodall Institute UK to learn about his conservation visions. They also learnt to plaster and assisted build the lab. OCTOBER saw retired physician, Richard Stevens, from Eugene coming spend two months living in the African bush, he was immediately put to work connecting water lines, laying out foundations and shared welcome knowledge with students. In November Fawn Moser from Topeka Zoo and Seth Frankel the zoo's designer for the new Cowabunga Safari exhibit spent a few days interviewing Greg and seeing PDRT in action. Finally with conservation of habitat ever at at the forefront of our minds, special visitors Louise Bellet and Pierre van Cranenbroeck whose work entails sustainable farming and ecosystem services, very appropriate to PDRT’s mission to promote and facilitate study of better land use practice in the local area. End of the year pushed to reach construction targets all of which were met. The lab walls were plastered, windows glazed, and the highlight was the completion of the solar panel roof. Also over target the foundation shells for the study/sleep rondavels were completed. The ten units when completed will accommodate forty students with each student having his/her own space. Having struggled for many of his 25 years to have basic accommodation, something very close to Greg’s heart, it is hoped that these will be finished in 2016. Also completed was the foundation and first brick courses for PDRT’s Conservation Ecology Centre which will be the all encompassing centre for PDRT. Visitors aside, the time from May to October was split between continuing to build PDRT infrastructure and keeping tabs on painted dogs. At PDRT HQ there was great excitement as two presumed dispersing dogs crossed right through the site of the conservation ecology centre. 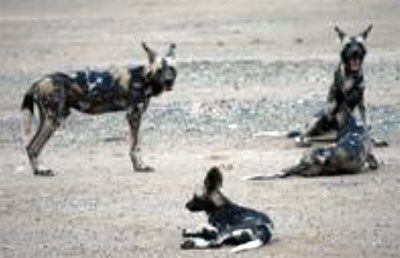 Locally in Forestry the known resident packs appeared and disappeared as painted dogs will. In Matetsi Safari area we were delighted to confirm that the Mopane Ngoma pack numbers twelve dogs and was seen the day after PDRT with all working vehicles and students assisted National Parks Ecologist Hiliary Madiri with the Matetsi area game count. In Forestry good news was that the Umgwazu pack bred again in the same area as last year though we didn't get a head count on the pups before the pack moved on. Special thanks go to National Parks and forestry staff who helped with scouts and general logistics. Happily overall dog numbers look OK, and through collaring hope is to better understand the transboundary movements and threats in 2016. LATE AUGUST and early SEPTEMBER had Greg and MK traveling back and forth from Sizinda to update pack identities in Mana Pools to follow up on survival of focal study packs. One of the important issues is the impact of people visiting dens in this area. Sadly each year the evidence mounts that visits to painted dog dens by tourists film crews and researchers alike should be stopped. Not only do den moves result in loss of pups during each successive move, but also results in reduced provisioning for the pups who then are not well fed enough to go nomadic at the normal 12 week age. In sad keeping with the latter, two dens that had been disturbed both had low pup survivorship. One such pack being the Nyakasanga pack that in 2014 was not disturbed and raised fifteen pups most of which survived to be yearlings. Sadly the same pack was disturbed in 2015 and only raised five pups. Unfortunately this is not a singular event and is associated with lack of provisioning of the pups resulting in stunted growth. Happily the Kanga pack at least was not disturbed and the alpha female Flame Lily was seen at Kanga Camp and judging by her teats (photo) nursing as always a significant litter. 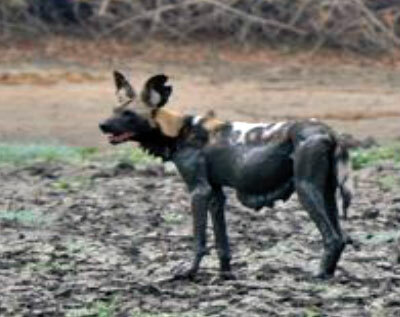 News also came in of a pack of dogs being found dead in Mana Pools, and whilst it was circulated to be cyanide poisoning, this was not validated and in fact ruled out by Zimbabwe’s Environmental Management Agency EMA. As PDRT’s mission has five components: (1) research, (2) direct conservation (3) conservation education (4) Training capacity building for the future of conservation, and (5) community development, supporting the future in the form of Zimbabwean students is of great importance. Post Graduate student, Tafadzwa Shumba, was accepted into Oxford University's Panthera post graduate diploma Programme. Greg took the opportunity to spend some time with Tafadzwa while in England in April and received extremely positive feedback from tutors on his performance. After the six month long intensive study Tafadzwa is back full time with PDRT as a budding ecologist. Happily he passed his driving license, this paves the way for him to spend a lot of time in the field in 2016. Plans are underway find sponsorship for Tafadzwa to continue into a good Masters programme. Post graduate, Tendai Nekatambe, works on her Masters and has had a variety of opportunities to expand and share knowledge by participating in a Human-Wildlife assessment in conjunction with a questionnaire developed in collaboration with Zimbabwe's Park Service Matetsi Research Station and PDRT; was invited to attend an Ethnobiology Workshop; attended the 2nd International Footprint Recognition Technique Workshop in Namibia; and recently participated in Zimbabwe's first Vulture Action Planning Workshop. Post graduate, Tatenda Muchopa, received a scholarship to attend an accelerated GIS programme at UC/Davis in San Francisco, organized by ESRI. Tatenda now is working on using her new skills to map potential corridors for painted dogs over the whole Zambezi region. Undergraduate students from the University of Zimbabwe, Terence Magqina and Tadiwa Mutizwa, finished their attachment after participating in the Matetsi Human-wildlife conflict survey, collecting information, footprint images and faecal samples for parasite and hormone analysis. We wish them well in their future endeavours. They also had an opportunity to work with Patricia Pritchard of Victoria Falls Wildlife Trust who facilitated a parasite egg flotation training. Joining the team in 2015 are Emmanuel Mutirwara from University Zimbabwe, Mike January from Bindura University and Loswitha Murugani. Loswitha is the first candidate on a school gap year attachment, here the best students in sciences at the local secondary school are offered a year of experiential training and learning, after which PDRT commits to their further schooling up to university entry level. 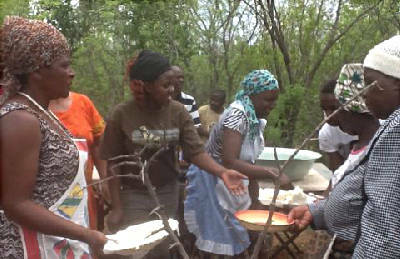 We are delighted to have Loswitha with us, she is now a committed member of the PDRT pack and a conservation advocate. December 1st was a milestone celebration for PDRT and the community. 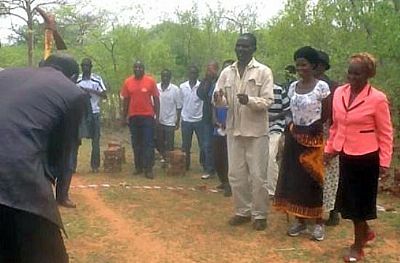 A formal Groundbreaking ceremony was held at the site of the CEC Community Meeting Centre with Chief Mvutu swinging a traditional pick and great whoops of joy from the tremendous group of Sizinda villagers attending. At the presentations we heard the ‘voice” of the community. As well as the Chief and village heads speaking, two members of the community spoke out saying what PDRT meant to them. Here they made clear was that they welcomed the project ideas coming in and the fact that PDRT had kept their promises with work and training. This was particularly pertinent for the local women who this year lost their primary income cutting thatching grass in National Parks estate. This was due to the fact that grass cutting season coincided with the killing of Cecil the lion and as a positive response National Parks had to deploy every available ranger to monitor hunts on private land. Consequently there were no available scouts to protect the women when cutting grass. 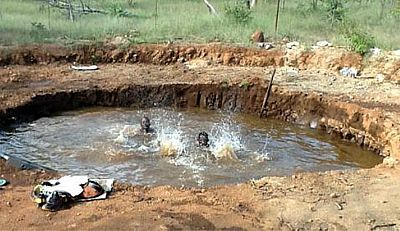 Greg responded to this crisis by ramping up the water cistern project and gravel making that assisted the women make up for lost income. The party continued well after all the food and drink were gone and only stopped when the generator keeping the "boom box" alive ran out of fuel. Greg was off on his first real holiday since 2001 before starting his cross-country US and multi- country European tours. FINALLY BUT DEFINITELY NOT LEAST... THANK YOU TO ALL FOR YOUR SUPPORT IN 2015. IT MEANS THE WORLD AND MAKES ALL THE DIFFERENCE. On a very sad note, Greg Gibbard, long time Australian 'best mate' of Greg's was tragically killed in the early hours of April 8th. Gibby is greatly missed by Greg, the conservation world, and all those who knew him.